A quick response and great communication. A team experienced with insurance claims. Safe removal and complete cleanup. From a team that cares about your trees, improving your property value, and making your home safe. We Appreciate Your Trust in Forest Tree Service! 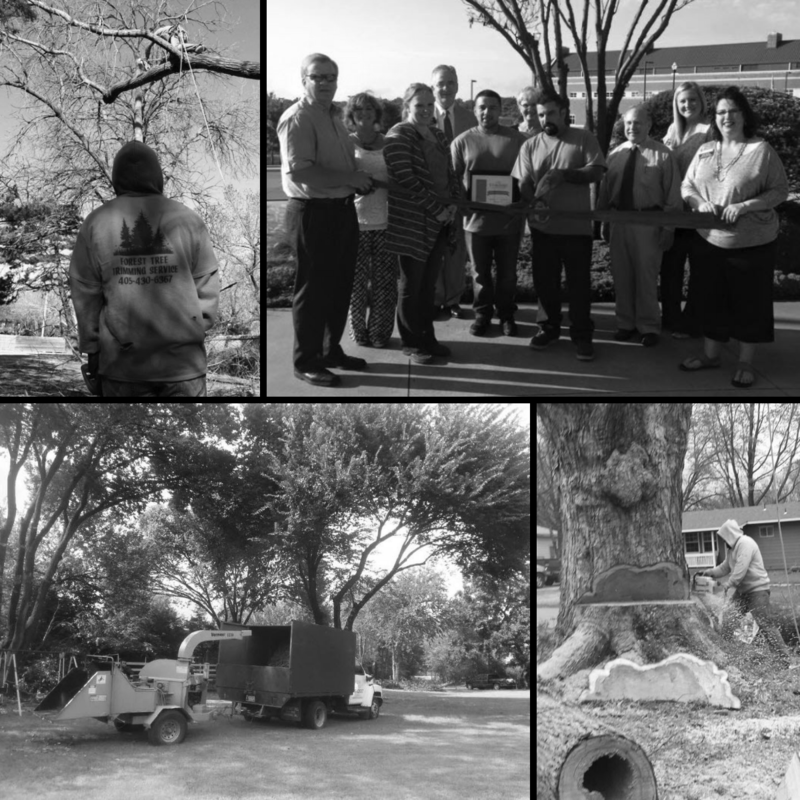 When you are ready for professional, affordable tree services from a certified (and friendly) OKC arborist, call Forest Tree Services in OKC. If you live in Oklahoma… and have trees… there is a very good chance that you are going to need an emergency tree service and removal company at some time. Tornadoes, high winds, and ice storms can be too much for even the strongest Oklahoma trees. When this happens you need to be safe, protect your family and home, and call an experienced local emergency tree removal company. If a tree looks like it needs an emergency removal, the worst mistake you can make is getting closer to it. You want to observe the tree from a distance. A tree may appear as if it has a solid footing but a gust of wind can send it rolling in your direction. The first measure you need to take is to ensure that your kids and possibly pets are located and close to you. Kids and pets can easily wander closer to the danger zone, inevitably endangering their lives. Even though you might feel the urge to rush back into the house to pick up a few mementos, do not do it. Leave it to the experts to resolve the issues. Besides staying far away, you should block off the area with a car or sawhorses. This will ensure that unwitting pedestrians are not injured. You can also place a written sign nearby indicating that the tree is a danger. If the tree is leaning on power lines or is likely to touch power lines, call the utility provider immediately, and inform them. They will immediately shut off the power and start the process of repairing the power line. After that, contact the arborists and let them do their work. They will appreciate if you keep your distance as they carry out this dangerous but necessary task of getting rid of the tree. In what appears to be an emergency, one of the best choices you can make is to stay calm. If you start panicking, it may attract the neighbors and other well-meaning people. Although they mean to assist, you might end up putting them in the path of danger. Do not take any emergency advice from your neighbors no matter how good it sounds. They are most likely just as scared as you and they are only trying to be helpful. Always remember that they are not professional arborists. Some neighbors might even want to go under the tree to examine it. Do not allow them to do it no matter what they say. One will soon turn into a crowd and all their lives could potentially be in danger. If you feel that, the tree could slip and flatten the house, ensure that you get in touch with a professional emergency tree removal company. Do not call your neighbors first, that is unnecessary and possibly dangerous for them. While you might not have much time, you can take a few minutes to determine that the company you use has certification. One way to raise the costs is to allow an unqualified person with a chainsaw on your property. They will make things worse and your insurer might not pay if they cause any further damage. If the tree hit your house, the insurer will pay if a professional company bills them. They will most likely not pay if an amateur tries to bill them. As you know, a tree could continue slipping since its roots might be rotten or it might be old. The longer you wait, the more the damage it is likely to cause. The sooner an expert can assess the situation, the better for all. In most cases, it will only take a few minutes to determine whether the situation is an emergency tree removal. You will discuss the costs and the timeline. This will help you to determine if they are the right service to use. If you do not like their service, you will have more time to call for a new service that suits your needs. After a storm, a tree may be flung so hard against the house that it pokes through the roof and parts of the wall. In such a case, you are required to secure the damaged section. Insurers expect you to take reasonable measures to prevent further damage such as water damage from the rain. Also, ensure that you take numerous photos immediately after the incident but from a safe distance. This will help with your insurance claim.